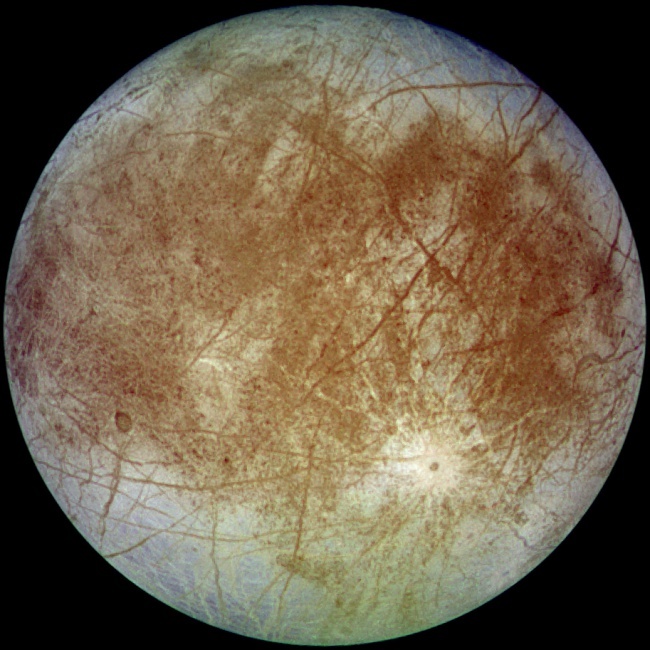 Jupiter's fourth largest moon, Europa is famous for being covered in water ice - and for the possibility of the liquid ocean that may lie beneath it. But beyond that, its surface is scarred with intersecting lines - cracks and dark streaks that span the entire globe and can reach 20 km in width. The origin of these lines is unclear, but the most likely hypothesis states that they are the result of warm ice erupting onto the surface, not unlike the way ocean ridges open up on Earth and spew out lava. Once again, tidal flexing is thought to be what is causing the internal heating of the moon. But were that the case, then the lines should be appearing in predictable patterns, and yet only the youngest ones are - the older lines aren't where they should be. Why? One theory suggests that Europa's icy crust is rotating faster than its interior, but ultimately, Europa leaves us with more questions than answers.